Bloomberg has a professional-grade site that lets you watch movements in just about any commodity that you can imagine, including gold, silver, and platinum. CME Group lists prices on many of the major commodities such as corn, soybeans, wheat, and ethanol. Bloomberg lets you see the yields on just about any major bond or Treasury you can imagine. 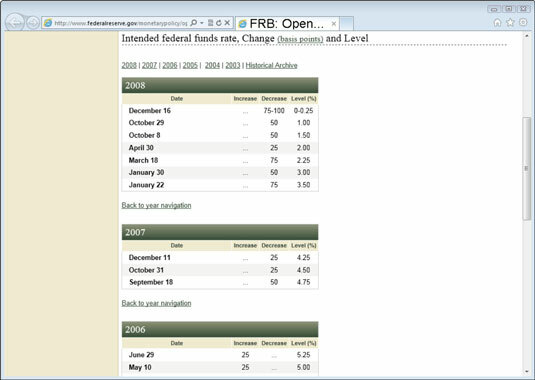 Federal Reserve Bank is the online presence for “the Fed,” as it’s affectionately called. 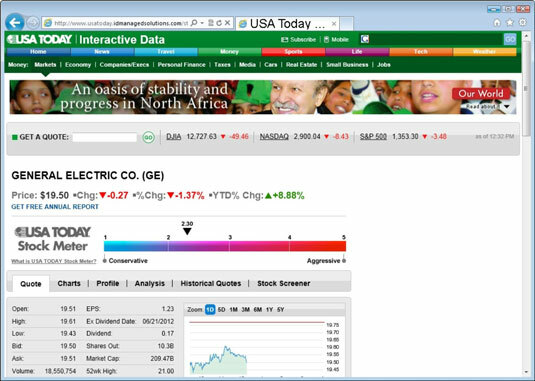 Market news: Monitoring general market news can help you spot trends and keep abreast of daily changes. Google News has a business section that pulls in important financial stories in one place. 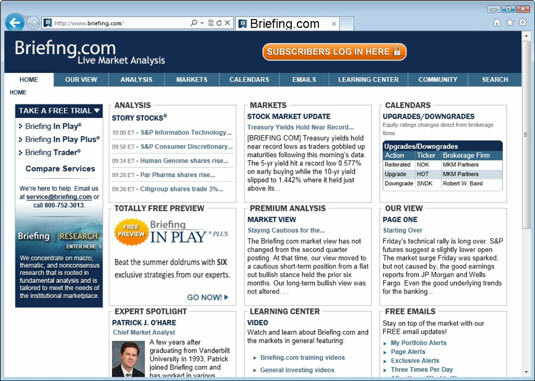 Briefing.com is similar to the kind of data services that professional investors use to follow news. MarketWatch is a comprehensive site for all the business news you’ll need. BigCharts.com is a service of MarketWatch dedicated to serving up graphical information about the markets. Motley Fool offers content for the active trader, including stock tips galore, as well as tricks and techniques on how to deeply analyze companies’ financial statements. Reuters makes high-end systems used by many professional traders and puts many of the same tools into your hands. USA TODAY’s Money section delivers the business news that affects you. The site also has an interesting stock-rating service. By entering a stock ticker symbol, you can see how aggressive or conservative an investment in that stock would be according to the USA TODAY Stock Meter. The Wall Street Journal Online is a source of breaking financial news. Financial Times is a London-based business publication, so it provides a unique spin on business events here. CNBC offers many of the same things as other financial news sites. What makes it unique is that it lets you view segments that aired on CNBC that you might have missed. CNN Money contains specialized information on markets, technology, jobs, personal finance, and real estate. Investor’s Business Daily is largely geared for active investors and allows subscribers to read the next day’s paper early. Barron’s is a weekly publication written mainly for more advanced investors. The company’s Web site: Most provide a section with their complete reports. Financial sites and portals: Most of the sites listed earlier provide links to the documents. Aggregation sites: These sites, such as FreeEDGAR, parse the filings from companies and make them easy to find and download for free. SEC Info sorts all the regulatory filings into easy-to-understand categories. The Securities and Exchange Commission: For most investors, the free SEC site has as much info as any sane person would ever want, and it isn’t too difficult to navigate to boot.